Given the incredible difficulty of forecasting the future, it’s extremely rare that the amount of revenue collected by the state of New Hampshire precisely matches official projections. However, that is exactly what occurred in the month of April, as the General and Education Funds received $271.7 million, the exact amount policymakers anticipated in setting the budget last summer. While beating expectations is generally better than matching them, shooting “par for the course” in April has essentially guaranteed a significant budget surplus for the current fiscal year, since the state has now received approximately 86 percent of the revenue it should expect for FY 2016. Consequently, NHFPI estimates that the General and Education Funds will finish $80 to $90 million (excluding tax amnesty receipts) above what the legislature had originally projected. A more subdued revenue outlook by the Committee of Conference is a part of the reason why revenues are so strongly exceeding expectations. Last June on its first day of meetings, the budget conference committee adopted updated revenue projections for FY 2016-2017, based on figures approved by the House Ways and Means Committee. These estimates projected that General and Education Fund revenues (before any changes in policy) would grow by 1.5 percent in FY 2016, from $2.255 billion to $2.288 billion. This was in contrast to the 2.3 percent projected growth rate that the Governor’s Consensus Revenue Estimating Panel, of which NHFPI is a member, put forth in May 2015. In comparing the details of the two forecasts, the House Ways and Means Committee was less optimistic on revenue streams that are generally thought to be influenced by economic conditions, such as business taxes, the meals and rooms tax, and the real estate transfer tax. Yet, it has been exactly those three taxes which have been principally responsible for the exceptional performance of state revenues. While it would have been difficult to foresee the performance of business taxes to date, given the information available at the time, projected growth rates of 5 percent in the meals and rooms tax and 2.6 percent in the real estate transfer tax were a tad dour. If the House Ways and Means Committee had altered their projections closer to the Governor’s, revenue expectations for FY 2016 would have been about $20 million higher. 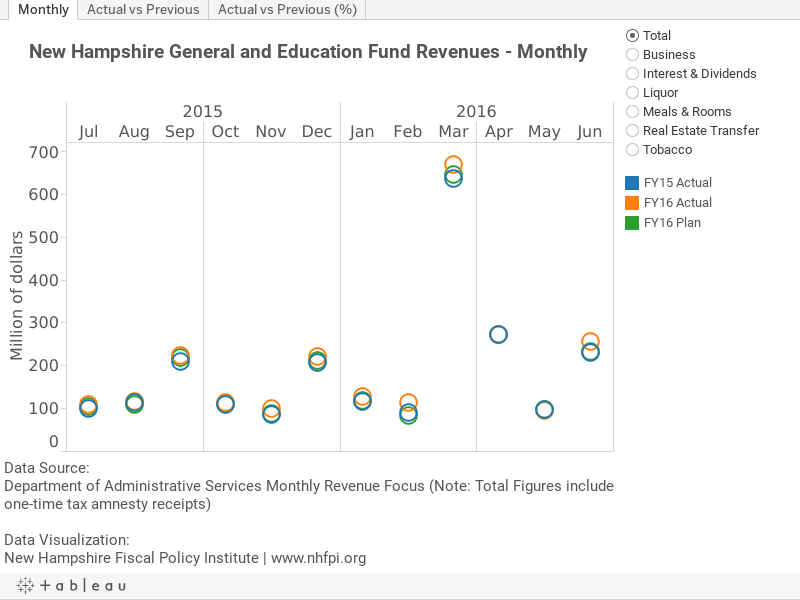 The private sector in New Hampshire is doing quite well. Through the first nine months of FY 2016, business profits and business enterprise taxes collectively have yielded $517 million. This represents a 15 percent increase from what these two major revenue streams generated in the first nine months of last fiscal year. This phenomenon is not a new one, as business taxes have been outpacing expectations since September. This stronger than expected performance appears to signal that Granite State businesses are faring well. Two separate surveys, one of New Hampshire households and the other of New Hampshire payrolls, that measure labor demand validate this. After maintaining a steady pace throughout 2013 and 2014, both the rate at which New Hampshire residents are employed as well as the rate at which New Hampshire private businesses are adding jobs picked up some steam in early 2015 and has persisted through this spring. Intuitively, one might think these two surveys measure the same thing, but they do not, since not all residents work in the state and not all workers on New Hampshire payrolls are residents. Nevertheless, each is a good confirmation of trends in the other and both point to robust conditions for private business that extend back for nearly a year.